At their own pace, readers learn the basic concepts of genetic genealogy. They then build on that knowledge as they study the testing, analysis, and application of Y-DNA, X-DNA, mitochondrial DNA (mtDNA), and autosomal DNA (atDNA) to reach and support genealogical conclusions. Each chapter includes exercises with answer keys for hands-on practice. Individuals may purchase a print edition of Genetic Genealogy in Practice from the NGS Store starting 12 September. Visit the NGS website to order. Blaine Bettinger is an intellectual property attorney in Syracuse, New York. The author of The Genetic Genealogist blog, he is a genealogy educator, a trustee of the New York Genealogical and Biographical Society, and organizer of the Shared cM Project, a crowdsourced project examining the associations between genetic data and genealogical relationships. Debbie Parker Wayne is a professional genealogist who has conducted research for individuals as well as for the PBS series “Finding Your Roots” with Henry Louis Gates Jr. and other television shows. She is an award-winning author, the coordinator for genetic genealogy institute courses, and the DNA Project Chair for the Texas State Genealogical Society. 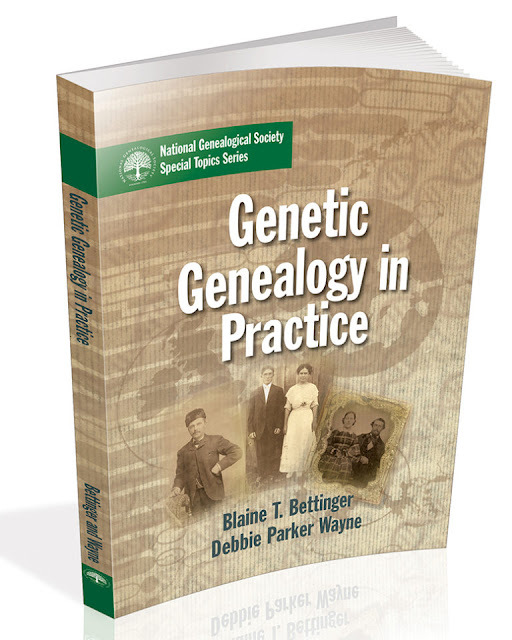 Visit the NGS website to learn more about Genetic Genealogy in Practice and other NGS special publications.